For the last day of Lentil based, I chose chickpeas, simply because its one of my favourite legumes – oven roast them as nibbles, make them into tikki, toss it into a Chaat ,make Harira (Moroccon stew) or Chole. Its very convenient cooking and storing this in bulk . Defreeze a portion and whip up a lovely healthy sundal (steamed salad) in no time at all. Make it, eat it. Sundals are that simple, yummy and proteinicious too – a perfect tea-time or an after-school snack. 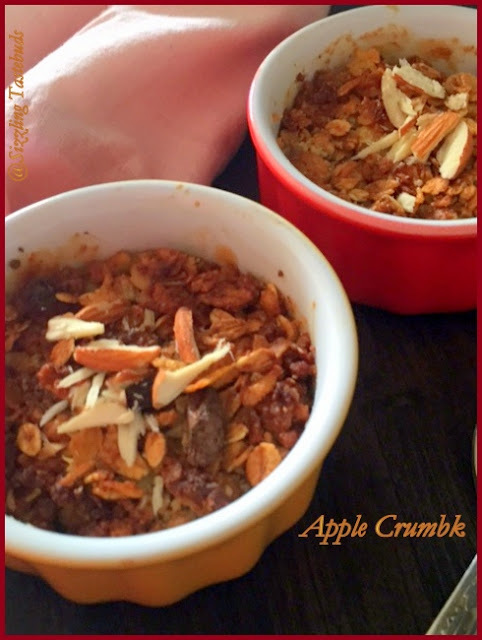 Its wonderful to munch on this hot Sundal during the monsoon and am sending this to my event & giveaway - #MonsoonMojo too along with Blogging Marathon. Cuisine : Indian, type – Vegan, can be made GF (Gluten free) too. In a pan, add oil. Splutter the tempering ingredients, sauté ginger and chillies. Now add cooked chickpeas, salt (if using). Stir well but don’t let the chickpeas go mushy. 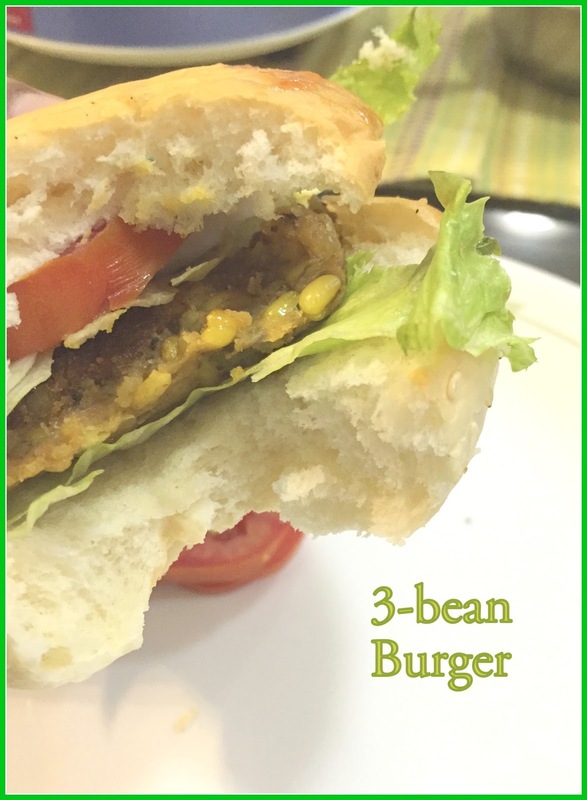 I have been eyeing to make multi bean burger patties for a long time. Having experimented with beetroot ,potato patty varieties, this vegan 3-bean burger came about as a dinner experiment (albeit at the last hour when kiddo wanted to have something different for her dinner). So, I had to use what was on hand, and we liked it a lot. Go on, make your own combo – the protein filled patty is sure to be filling and healthy..
Masoor dal (whole brown lentils) – ¼ cup - parboiled and drained. Burger buns (store bought) – 3 nos. Boil water vigourosly (about 5 cups) and divide into 2 different portions. Soak the yellow moong dal and masoor dal separately for 30 mins. Meanwhile pressure cook potato ,peel and mash lightly till fork tender. Now boil the dals separately till done and has a bite but not mushy. Drain the water completely. Add half the chopped onions, spices to the potatoes, drained dals , chickpeas and mash well. 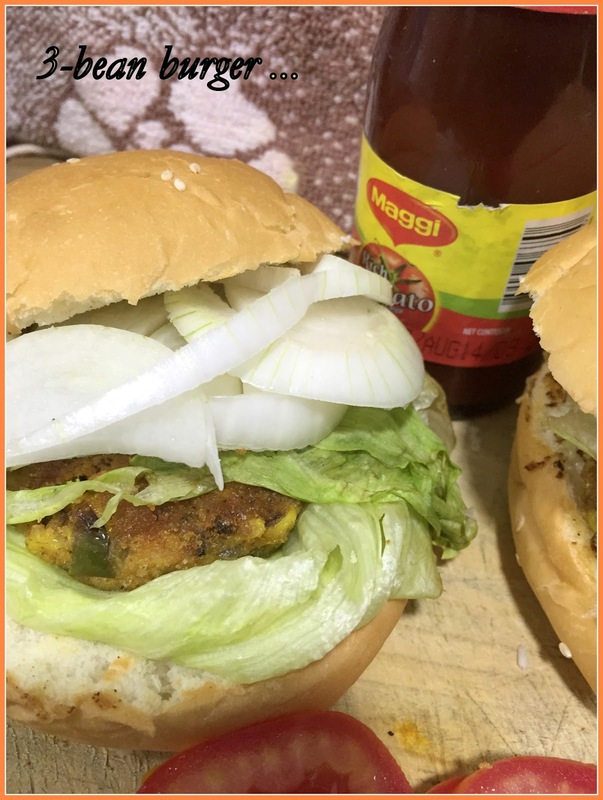 make a patties (tikki) – thick enough as burger patties . Shape into roundels, cling wrap and refrigerate for 15 – 20 mins. Shallow Fry them in 3-4 TBSP oil till they are crunchy on both sides. Cut the buns horizontally into two. Grease the burgers slightly on both sides, Place the burger buns upon torn lettuce leaves, top with onion slices, tomato and cucumber slices. Close with the top portion. Repeat with other burger buns. Slightly grill on a hot skillet for 2 mins. Winter produce brings in a lot of variety into the veggie basket like Purple Yam (Kand), Sweet Potatoes, Fresh Green Peas, Hara Choliya (Fresh Green Chickpeas) etc. While I generally make Oondhiyoo once or twice during the winters, today's post is with fresh Choliye that my maid got from her farm (yes, this post was to go up last winter, but was lying in the drafts to be revived now) and with potatoes this makes an amazing gravy. My colleague - Ms.P, who is from Chandigarh taught me this amazing dish, and since then I make this whenever I can get my hands on these beauties.. Just like raw shelled peas, we all love to munch on these as is - it's mildly sweet and has a crunch too. So, lets get on to making this easy peasy dish while this goes to BM 54 under "Cooking with Lentils" theme all this week :-) Also goes to MLLA #85, hosted by Jagruti , event by Susan & Lisa. Course : Accompaniment, Cuisine : North Indian. Peel potato, cube and reserve in a bowl of water. Grind all ingredients under "To grind" to a smooth paste. In a pressure cooker, add oil, splutter jeera, add this paste and saute well till it leaves oil, about 4-5 mins. Add the potatoes, shelled fresh Choliye, 2 cups of water, salt and pressure cook for 3-4 whistles. Let the pressure release slowly on its own. Open lid and lightly mash 1 or 2 pieces of the potato. Now add the rest of the spices - turmeric, coriander powder, Garam Masala, red chilli, jeera powder. Add 1-2 tsp of water if its too dry. Let it simmer for 5-6 mins till the masala coats all the veggies and the legumes. 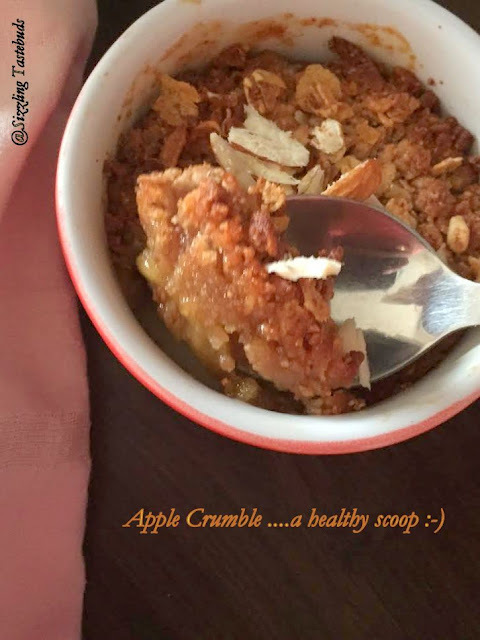 If you prefer to make it totally grain free as the original version did, skip the muesli / Oats entirely and use just almond flour. This also goes to Harini’s Fruits Theme – Kids Delight, event by Valli, and also to Blogging Marathon. Stew the apples on a low flame with 1/2 cup of water, butter, honey, brown sugar, cinnamon sticks till the apples become mushy and most of the water evaporates. Take out the cinnamon sticks if using, add lemon juice,cinnamon powder,stir and keep aside. 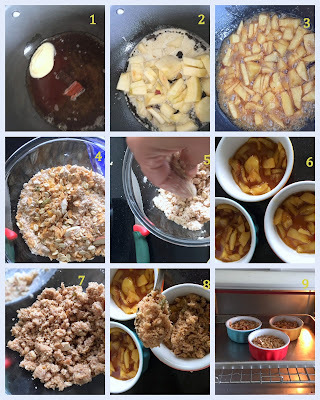 Grease the ramekins, add the stewed apples at the base, spread the almond-muesli on top. Bake in a pre-heated oven at 200C / 400 F for 8-10 mins or till the muesli turns golden brown. Slightly cool. Serve as it is or with a dollop of vanilla ice cream.